I left Washingborough yesterday and headed up stream to Stamp End. I was over taken on the way by a cruiser that was travelling at about the same speed as me but I thought it would be easier if he opened the lock and I went in first then closed up after he left so I let him pass. It certainly takes a lot of effort out of travelling when this happens. Just before the centre of Lincoln I moored up and went shopping and booked the bike in for an MOT. To get across to the market area one crosses the road via a foot bridge. 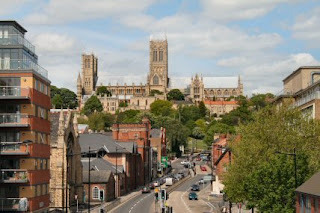 From here you get one of the nicest views of the Lincoln Cathederal. 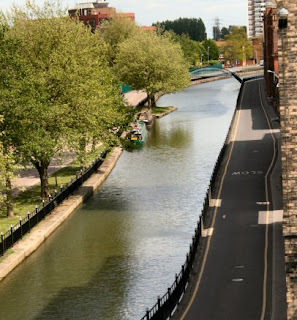 And from the same point the view down the canal shows the mooring which is not as busy as the centre of Lincoln. The centre was crowded with youngsters and they were all very well behaved and enjoying their meetings with friends and the sun. It was nice to see. I stopped the night at the end of the Uni mooring and visited B&Q to pick up some bitumen paint. I have decided to have the sides to just below the gunnel painted black as it is easier to match up rather than the green it is now. First thing started the move on towards Saxilby and the diesel at Tongs DIY shop. With the engine on tick over the journey was slow and I let the Brayford Belle through and passed her again after she had turned around at the Pyewipe Inn. It was then I was hailed by the hitch hikers!! 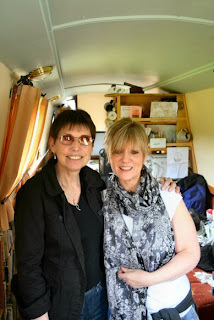 Not really they just wanted to know about narrowboats as they were thinking of a holiday and wonder if they would be able to cope. It made a refreshing change from normality. Granchie. Can I have a Welsh cake please? Bit of a Curates Egg. Rubber Duck or Hatted Duck?